The Egyptian billionaire Naguib Sawiris was in Dubai last week in a bid to persuade wealthy Arabs to buy property in the Cypriot nightclubbing hot spot Ayia Napa. The 62-year-old businessman, who is part of the powerful Orascom-owning family and heads its telecoms operations, is partnering with Cypriot real estate firm, the Caramondanis Group of Companies, to build a €220 million (Dh871m) resort on the Mediterranean island called Ayia Napa Marina. With EU member Cyprus either side of an hour’s flight from Beirut and Cairo and around four hours’ flight from Dubai, the partnership hopes to persuade wealthy investors from Arabian Gulf countries and the Levant region to buy off-plan flats and villas in the upmarket marina project in the town of Ayia Napa. The area is known for its nightclubs and package holidays, popular with party­goers. 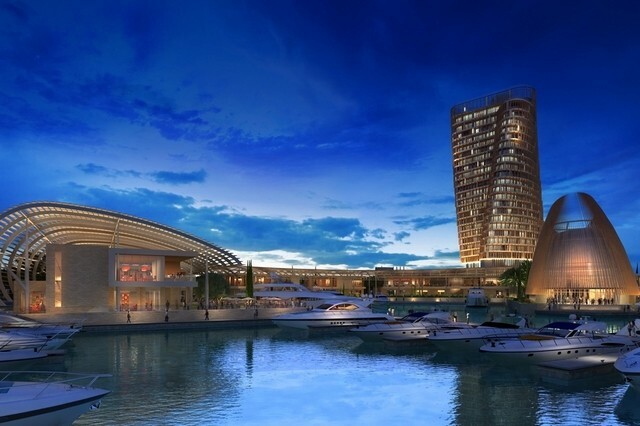 The project will build two 25- and 26-floor twisting modern towers containing 190 apartments, 29 villas and a 600-berth marina in the town, offering the type of upmarket accommodation which is currently lacking. With prices starting at €500,000 for a one-bedroom flat and rising up to €5.2m for a four-bedroom villa, properties at the new marina will not come cheap. Construction started in September 2016 and the development is not due for completion until 2021, meaning there is little to see at the moment. But the partners promise that residents will be able to enjoy all the mod cons including two private beaches, fitness facilities, a concierge and full facility management. When will the project actually be finished? According to Ayia Napa Marina, the marina itself will be completed by 2019. Half of the apartments will be completed in 2020 and the other half in 2021. What other reasons would attract an investor to this development? The partners says that real draw for many of the wealthiest investors will not be the property at all but rather the fact that owning a property in Cyprus can offer access to Cypriot citizenship and the right to live and work within the European Union. According to Ayia Napa Marina, the government of Cyprus will grant Cypriot citizenship to those who invest a minimum of €2 million (Dh7.9m) in the country. This enables property owners and their immediate family members who fulfil certain requirements the right to live, work and travel anywhere in the EU. What if I can’t afford €2m? The Marina owners say that for Non-Cypriots who purchase a property of a minimum value of €300,000 will be granted a Cypriot Permanent Residence Permit for themselves, their spouses and children. What would I actually be buying? Properties at Ayia Napa Marina are being sold through a 50-year sublease until 2067 and a long-term lease agreement that runs until 2139.